Ok guys, this is a super quick post because I just wanted to share this recipe. 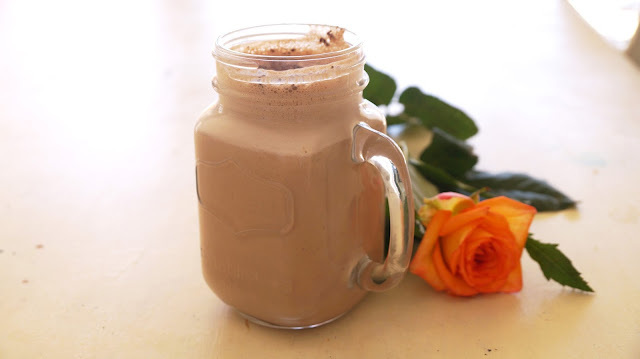 I have been obsessed with this 'milkshake' for a long time but I recently started drinking it every day. Because of ongoing issues with my health. Balancing side effects from tamoxifen, recently getting diagnosed with osteoarthrits and endemetriosis, as well as still healing my body from cancer treatment last year. I have been forced to try and eat as healthy as possible. I cut out meat and would love to go fully vegan in the near future. The problem is I have a massive sweet tooth. One of the things I have been subsidizing a regular chocolate milk with is tise amazing smoothie. It is so sweet but made with healthy ingredients. The reason I love this is because it really is delicious, but it also gives me a heap of energy and is a great breakfast if you need something quickly or you're in a hurry.